The point of American conservatism is misdirection. It is a movement designed to fail, a program organized to lose, a racket masquerading as resistance. For that reason, much of what passes as “intellectual conservatism” is an attempt to disguise the obvious and to funnel political momentum into pointless dead ends. Even as European-America perceives that its country, culture, and future are slipping away, American conservatives are still babbling about the need to give tax cuts to billionaires, abolish Social Security, and start a nuclear war with Russia over Crimea. Be it out of stupidity or malevolence, you can always count on an American conservative to miss the point. 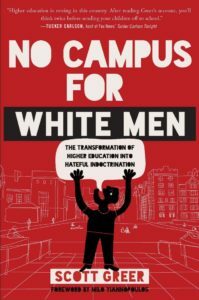 Thus, ordinary college students mired in the open-air lunatic asylums of higher education will greet first-time author Scott Greer’s No Campus for White Men with no small amount of surprise and relief. Greer doesn’t just make the usual conservative complaints about “liberal bias” or lack of attention toward “limited government.” Nor does he create some elaborate theory about an obscure ideology which has mysteriously captured academia. He concisely, passionately, and accurately defines what college is all about today – hating white people. Diversity in today’s America simply means having fewer whites around. Segregation, such as universities having racially exclusive dorms and events, is great as long as that racial exclusion doesn’t mean “white only.” An all-black dorm is a sign of diversity, but an all-white fraternity is a sign of Jim Crow. For racially conscious European-Americans, this may seem basic. But for conservatives, this is revolutionary. The American conservative movement (sometimes called Conservatism, Inc.) has spent many millions of dollars trying to bring its message to college students. Yet its programs  focus solely on limited government wonkery, Boomer nostalgia (like celebrating Ronald Reagan’s birthday), or celebrating “free market capitalism.” As Greer points out, American higher education is now dominated entirely by questions of race, culture, and identity. Meanwhile, young conservatives are being told they should be mobilizing in opposition to President Trump’s proposal to impose a tariff. Greer’s inaugural authorial effort is an invaluable guide to planning a counter-offensive. Critically, Greer does not claim multiculturalism is simply a way to trick minorities into supporting a “big government agenda.” Instead, Greer calmly explains why the current campus hysteria is the natural result of both misguided policies and unchallenged ideological assumptions. Among the former, Greer explicitly identifies affirmative action as the key enabler of campus multiculturalism. Originally, affirmative action was meant to be temporary, and would be abolished once “white institutional racism” had ended. 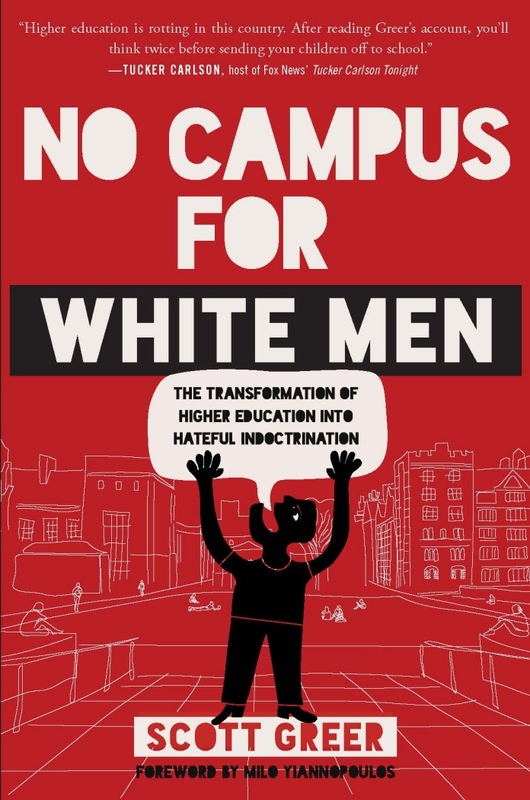 Of course, once established, affirmative action created a self-perpetuating constituency within higher education which needed new explanations about why “white institutional racism” was still present in order to justify its own existence. Furthermore, when unqualified students are admitted to universities and find they can’t meet the requirements , they are told white racism is the only explanation. Thus, admitting minority students actually encourages radical racial activism, rather than bridging the racial divide. Still, the Supreme Court needed a rationalization for the continued existence of affirmative action. What they came up with was “diversity,” which was declared a compelling state interest justifying continued racial discrimination. Most conservatives are deeply defensive about diversity, and are uncomfortable with the monochromatic character of their movement and their party. Greer, to his credit, attacks it head-on as a “religion” and a “cult.” He points out there is little actual evidence to suggest that racial diversity is, in itself, a benefit. In contrast, as the Putnam study  showed, diversity destroys social trust. However, what makes this book truly to superior to a Conservative Book of the Month type of publication is Greer’s knowledge of the realities of power. Conservatives are committed to the fantasy of being in control . Therefore, they are quick to dismiss liberal protesters as powerless losers or spoiled brats. Greer does not make this mistake. He takes the campus Left seriously rather than dismissing them as snowflakes or for being fragile. What we are presently witnessing at college campuses is not the result of overly coddled backgrounds and helicopter parenting. It’s the beginning of an extreme version of identity politics. An identity politics that encourages students to demand power and privilege on the sole basis of their race, gender, or sexual orientation. An identity politics that hopes to disenfranchise and humiliate large segments of one’s fellow students. An identity politics that’s increasingly bordering on outright hatred for white people, especially white men. The importance of this point cannot be overestimated. Every conservative will denounce “liberal bias” on campus but few will recognize that political correctness is part of a system of power. It is politics in its purest sense – who doing what to whom. Citing Marcuse’s famous justification of “repressive tolerance,”  Greer dismisses the egalitarian rhetoric of the Left as simply a justification for a new hierarchy. “Simply put, political correctness assigns more power to protected classes and stifles the speech of those who don’t fall into a special category,” he observes. The one group now allowed to have a powerful identity is whites. Every identity bases itself on opposition to either “whiteness” or the majority culture, or both. No form of “white identity” would be allowed by either administrators or activists. Individuals who join with the activists who can’t claim protected class status are given short shrift by their supposed allies. Those students, particularly Greek life participants, who don’t join in the social justice cause are singled out for harassment. Even those who are racially aware will benefit from Greer’s chronicle of fake hate crimes, all of which were used to justify sweeping campaigns against whites and press for further concessions. And no matter what the circumstances, any concessions made only serve to fuel the next campaign. “The admission of guilt only serves to intensify the grievances of those who feel whites have done them wrong,” Greer notes. In short, don’t cuck. It doesn’t do any good. It’s the same lesson conservatives should have learned (but didn’t) from the 2016 election. Critically, Greer identifies the Greek community, fraternities and sororities, as a potential source of resistance to campus multiculturalism, and calls for them to mobilize politically to defend themselves. Considering how fraternities have largely gone into a defensive crouch in response to campus radicalism, his faith in the frat boys may be misplaced. But it’s as good a place to start as anywhere. And, as Greer notes, it was the Greeks who led the “chalkening” effort, that is, chalking Donald Trump’s name around campuses across the country last year, throwing many schools into outright hysteria. Unlike many books of this kind, Greer actually has some strong policy recommendations. Some, like encouraging state legislators to crack down on public universities and calling for student action, are expected. But the most important is his call to abolish affirmative action, one of the few issues which actually unites the American Right. Even figures who support more immigration and fiercely opposed Trump, like Linda Chavez , are against  affirmative action. One of the very few conservative figures who has not even rhetorically attacked affirmative action is Trump himself . This is the key issue which the Alt Right must champion in order to insert itself into the mainstream, as it is explicitly built upon the racial caste system Greer effectively dismantles, and is a great way to “heighten the contradictions” of the existing order. Of course, there are two notable problems with the book. The first, as you might expect, is that a (((certain question))) is left mentioned. Jews are never identified as a separate constituency, let alone as a powerful force within the American university. Greer is right to see political correctness as an inevitable outgrowth of affirmative action policies, and we can’t really expect a mainstream conservative book (especially one published by WorldNetDaily ) to broach the third rail of all Western discourse. Yet it’s impossible to imagine campus multiculturalism advancing as far as it has without Jews constantly pushing for further radicalization and serving in key administrative roles within the university system. Indeed, as Greer identifies administrative support for campus radicalism as an important cause of the collapse of universities, the role of Jews in this system is the critical element explaining why things have happened as they did. Ultimately, the full elimination of campus insanity’s poison would require massive cultural changes. Restoring an authentic national identity not dependent on empty platitudes would be a start. Undercutting the ideology of multiculturalism – which encourages Balkanization and separation from the national community – would also be a step in the right direction. Our society ceasing to feed into the Victimhood Olympics would send a strong signal to college kids to stop playing their own extreme version. Yet given that anti-white hatred, overt and unashamed, is now the core principle of America’s academic elite, how could an “authentic national identity” be created that did not depend on “empty platitudes”? The historic American nation was an ethnic and racial creation, as even center-Left scholars such as Samuel Huntington recognized . If affirmative action was abolished and a raceless meritocracy restored at the American university, it would be a step in the right direction, but it would also be portrayed as a triumph of “whiteness.” It would be (accurately) interpreted as a restoration of the older, “white” university system, just as a majority-white America which prevented further Third World immigration would be interpreted in racial terms. After all, Donald Trump’s civic nationalist campaign is widely understood, by both supporters and opponents, as nothing less than the first mainstream white identarian movement in the United States in recent memory. European-Americans, especially students, can’t abandon identity politics. Nor is taking it up something new. It is simply a return to the normal , historical, and healthy sense of self European-Americans possessed when this country was conscious of itself as a white nation created by a particular people. This process has to begin on the college campus, because it is here the attack on whites is most extreme. And as Greer notes, what happens on the college campus will eventually spread to the entire country. The SPLC, that noxious, profiteering, fraudulent coven of smear merchants, says a hate group has “beliefs or practices that attack or malign an entire class of people, typically for their immutable characteristics.” Greer’s critically important book shows that we can regard the entire American university system as one giant hate group targeting white men. Tactically, Greer presents some effective solutions towards resolving this problem, though he is ultimately too optimistic about the possibility of rebuilding an American civic nationalist identity. Yet even for those who understand that all politics is identity politics, No Campus for White Men is that rare conservative movement publication, a book no one interested in a serious analysis of the Western situation can afford to ignore. Perhaps no other book lays out so calmly, clearly, and systematically the real state of American higher education. Read it. Internalize it. But don’t make the mistake of thinking we’ll be able to defeat an entire system built around hatred of our people without conflict.